Free Shipping Included! 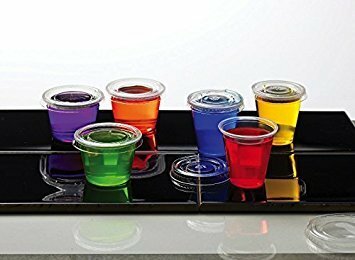 Toasted Drinkware Squeezable Plastic Clear 2 oz Jello Shot Glasses with Lids (100 Sets) Shaped Like Actual Shot Glasses! by Toasted Drinkware at Foom App. MPN: 159621. Hurry! Limited time offer. Offer valid only while supplies last. We finally found a drink you can't spill! Toasted Drinkware's 2 oz Jello shot glasses come with lids that firmly lock to hold any substance within. We finally found a drink you can't spill! Toasted Drinkware's 2 oz Jello shot glasses come with lids that firmly lock to hold any substance within. Jello shot glasses complement any occasion and can also be used for small finger foods, condiments or craft projects. Each package contains 100 clear shot glasses with lids. Jello shot cups are in the shape of actual shot glasses and not portion cups!!! If you have any questions about this product by Toasted Drinkware, contact us by completing and submitting the form below. If you are looking for a specif part number, please include it with your message.